Meteren, France. 13 February 1918. 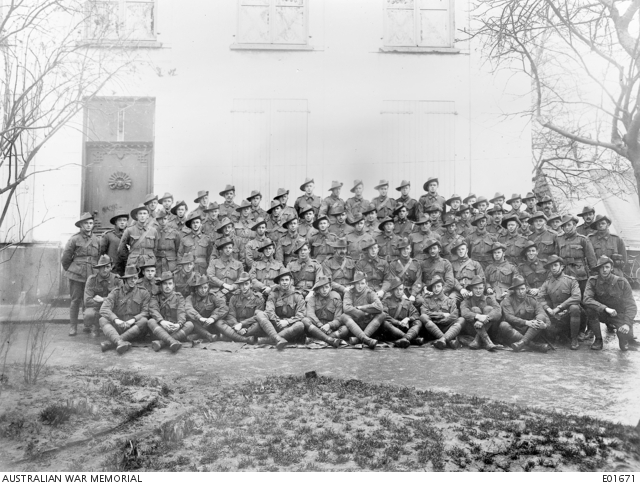 Group portrait of the Non-commissioned Officers (NCOs) of the 2nd Battalion, AIF at Meteren. Left to right, back row: 6590 Sergeant (Sgt) N. D. Thomas; 3936 Sgt W. T. Smith; 2456 Sgt J. S. Oakes; 395 C. F. Dobbie; 3715 Sgt A. H. Buckeridge; 2454 Sgt A. R. McPhee; 889 Sgt K. Rourke; 3254 Sgt W. E. Burton; 592 Sgt F. B. Barker; 2825 Sgt C. H. Handfield; 4126A Corporal (Cpl) F. D. Avery; 120A Sgt S. Pearce; 3648 Sgt H. W. D. Wildman (partially obscured); 474 Sgt E. R. Turner; 5775 Sgt D. Tennant (partially obscured); 7200 Sgt H. G. Turnidge; 198 Cpl H. S. Mascord; 887 Sgt J. B. Powell. Fourth row: 1556 Sgt L. Garlick; 1620 Company Sergeant Major (CSM) A. E. Rigg; 3160 Cpl C. Owen; 4248 Sgt N. McDonald; 7512 Sgt A. L. Mannigel; 4518 Company Quartermaster Sergeant (CQMS) H. Lancaster; CQMS J. Helmer; 925 Staff Sergeant (SSgt) J. Driscoll; 1052 CSM T. D. Brown DCM; 581 Sgt T. Heath; 5138 Acting Sergeant W. E. T. Lane; 2401 Sgt C. A. Fletcher; 3710 CSM F. W. Brooks (partially obscured); 2196 Sgt A. B. Robertson (partially obscured); 1029 Sgt C. Morgan. Third row: 7534 Sgt H. M. Sharp; 378 Sgt W. Crawford; 333A Sgt W. Edge; 6869 Sgt H. G. Williams; 2254 Sgt V. A. Robson; 1626 Sgt F. E. Stammer; 2352 Cpl A. E. Bourne; 3686 Sgt W. F. Aysom; 2575 CQMS B. R. Causer; 812 Cpl R. Wilson; 602A Cpl W. H. Reeves; 327 Sgt S. R. Oppy; 4245 Sgt A. E. McPhail; 3590 Sgt A. L. Patison; 4350 Cpl R. Williams; 2637 Cpl H. Martin; 3343 Cpl C. G. Lutton; 1849 Sgt V. Williams. Second row: 797 Cpl D. W. Scott; 651 Cpl R. R. Maloney; 6005 Cpl A. W. Eckley; 3911 Sgt W. Rees; 332 CSM H. I. Peisley; 394 CSM R. Haggath; 823 CSM W. Bonnett; 1003 Regimental Quartermaster Sergeant (RQMS) J. W. Hetherington; 376 RSM R. Coskery; 2154 CSM Jarvis; 1153 CSM T. H. McColl; 2910 Sgt H. E. Wansborough; 2649 Sgt E. McCarry. Front row: 1643 Sgt Charles Oscar Waltin; 7459 Sgt J. H. Douglas; 1947 Lance Corporal (LCpl) G. S. Lee; 1904 LCpl J. W. Armstrong; 3617 Sgt W. H. Simmons; 1705 Cpl W. J. Banks; 3913 Cpl A. E. H. Richards; 2131 Cpl C. H. Gall; 1439 Cpl H. White; 4295 Sgt A. T. Grant; 545 Cpl R. McClelland.